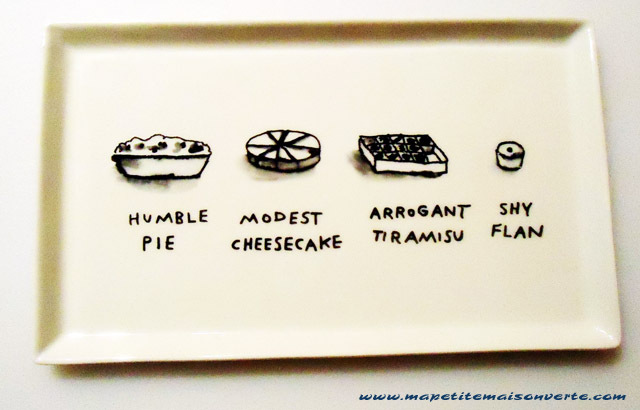 This fun plate is by Dan Golden. I got it at CB2. I am going to a recipe swap this weekend with some other gals and I’m planning to bring one of my favorite entertaining recipes. Alas, it’s not mine, but it is by someone I admire: celebrity chef Giada DeLaurentiis. I have been whipping up her Simple Baklava recipe pretty regularly for several years now. The only changes I make to the original recipe are to substitute pecans for the walnuts, and to add a little extra honey, if needed. I bake up several dozen of the baklava bundles for outdoor fêtes, Mediterranean dinners, and as a fun, bite-sized dessert for any occasion. I think they will be the perfect make-ahead treat to share with friends, and once I saw this funny platter, (see: http://www.dangolden.com/designs/cb2-collection/12677507 or CB2.com), I knew I had to have it to display my baklava. I only wish there was an entire set of witty dinnerware to match!